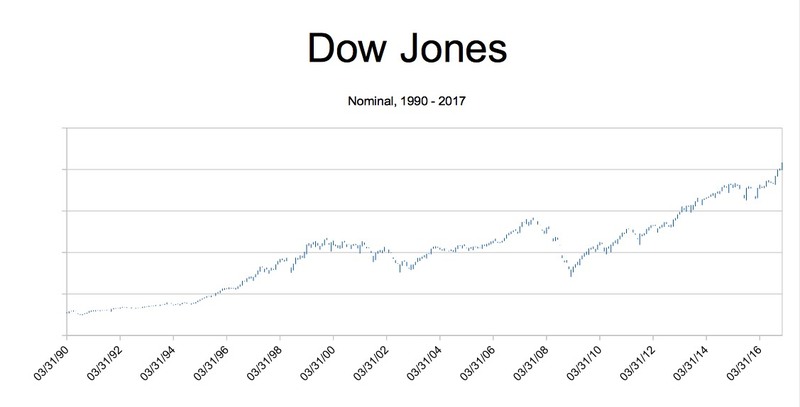 The Dow Jones Industrial Average (Dow), an index comprised of 30 of America’s larger publicly traded companies, and is often used as a barometer for understanding the stock market in general, was trading at 2,707.21 in 1990. Friday February 26, 2016 the Dow Jones Industrial Average (Dow) was trading at 20,841; nearly a 1,000% return in 27 years. Are these gains real or just an illusion? When you adjust the Dow for inflation, the truth is revealed. In the simplest definition, “inflation” is the increase of the supply of currency (debt) in excess of the supply of money (assets). Most commonly you may be familiar with the concept of “price inflation”, which is an increase in prices as a factor of the currency’s (dollar’s) decrease in purchasing power. We see price inflation every day. Have you noticed that a candy bar costs more than it did five years ago? How about the cost of real estate in the past 20 years? Have you ever heard your grandparents complain endlessly about how one dollar used to buy more in the “good ‘ol days”? By the way, unlike mainstream definitions, there is a difference between currency and money. You will notice that we either exclusively use the word currency or money – depending on the topic being discussed. In economics, inflation is the rate of decrease of the fiat money supply and the prices for a fixed basket of goods and services as measured from a fixed point in time; conversely, it is the decrease of purchasing power of each fiat dollar in circulation as measured by a fixed basket of goods and services from a fixed point in time. A 2% rate of inflation is a 2% increase in the cost of the fixed basket of goods (each $1 buys 2% less of it). A 2% rate of inflation means $0.98 of value for each $1 of fiat money in circulation in the economy over a period of time resulting in a loss of value of currency. When the price level rises, each unit of currency buys fewer goods and services. Consequently, inflation reflects a reduction in the purchasing power per unit of money – a loss of real value in the medium of exchange and unit of account within the economy. A chief measure of price inflation is the inflation rate, the annualized percentage change in a general price index, usually the consumer price index, over time. The opposite of inflation is deflation. Not you nor I. The controller of a currency, in this case the government through it’s conduit the Federal Reserve Bank (a private institution) benefits from inflation. Here’s an example: A government may borrow a sum of money, perhaps one hundred dollars and promise to pay it back, principal and interest, within a certain time period – say 30 years. The easiest way for the government to repay this loan is by devaluing the purchasing power of the currency by way of inflating (increasing) the supply of currency in circulation. In other words, if you owe someone $100 and also owned a printing press to print this currency (you will go to jail for doing this), then wouldn’t you agree that it makes paying off the debt easier than actually investing that $100 and trying to obtain a positive return on that investment in order to cover interest payments as well as repayment of the initially borrowed $100? However by printing the currency into circulation, it is only of benefit to the first user of the currency – which is not you, but generally well established financial institutions as well as companies. The reason this benefits the first user is that the marketplace has not yet determined that there is an increased amount of currency in circulation. However by the time the newly printed currency permeates the marketplace that usually shows up in the form of price inflation which generally hurts the average consumer (you). Has The Dow Increased 1,000% In Real Dollar Terms? So if the controller of a currency stands to benefit by devaluing the currency, which hurts you as the holder of that same currency, what should you do? Should you simply invest your currency into a stock index? I opened this piece asking the question if the Dow Jones Industrial Average is really up 1,000% in 27 years. The Dow Jones Industrial Average is up 1,000%, but that doesn’t mean you are wealthier by 1,000%. The Dow, moving from 2,707.21 in February 1990 to 20,841 in February 2017 would seem to be a huge move. But, let us examine the Dow’s actual value by comparing it to the value of a dollar, or said another way – by converting today’s Dow value of 20,841 into 1990 dollar terms. There are many ways for you to conduct this experiment. For this article we will be using the PCE index. The “core” PCE price index is defined as personal consumption expenditures (PCE) prices excluding food and energy prices. The core PCE price index measures the prices paid by consumers for goods and services without the volatility caused by movements in food and energy prices to reveal underlying inflation trends. Food prices consist of those included in the PCE category of “food and beverages purchased for off-premises consumption.” Prices included in the PCE category “food services and accommodations” are not included in the “food” price index because these services prices tend to be far less volatile than those for food commodities such as meats, fresh vegetables and fruits. Energy prices consist of those included in the PCE categories of “gasoline and other energy goods” and of “electricity and gas” utilities. The charts are near images of each other. The only real difference is the Y-Axis, which I intentionally omitted. The first graph is the actual Dow itself. In the second graph, I discounted the Dow’s numbers to the PCE index (1997=100). In 1997, the 2707 Dow level, after discounting for the PCE is equal to 40.971. Today, that number is 186.94. That is a total return of about 450%, a far lower return over 27 years. The other, “missing” 550% in the Dow’s nominal return would be inflation, or in other words, the erosion of the purchasing power of the currency. How Has This Impacted The Real Economy? You would have thought that America’s economy had performed better all of these years. It has not. True, there is an advancement overall. But, that advance is significantly lower when you compare things on a relative basis. Given that we are not as far ahead as we thought. 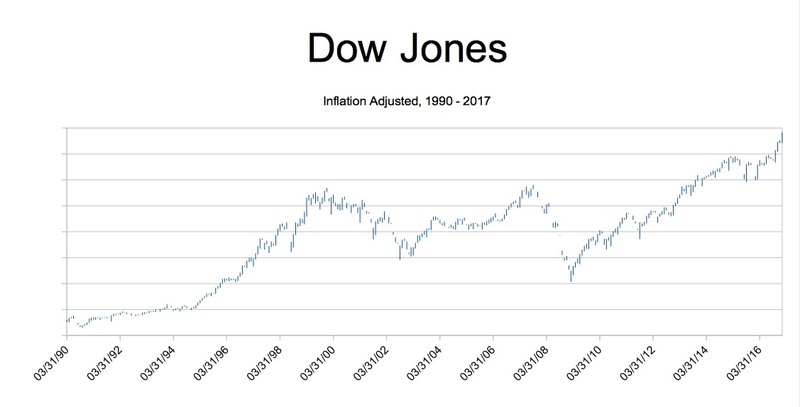 Discounting for inflation the Dow has not moved that much over an entire generation’s time frame. What is most interesting is that this expansion in the Dow was measured over one of the greatest economic expansions in our nation’s history: the fall of the Soviet Union and the Dot Com era. The internet brought in a host of advancements. So, while you may be reading this article on a device in the palm of your hand, a marvel indeed, the return on investment, as measured by the PCE index, is far less impressive. You will want to keep this in mind when you view your goals in life, investment, savings, and retirement. At the same time, given the numbers stated, a candy bar that cost $1.00 in 1990 is far smaller today or more expensive per unit (grams, ounces, etc). In fact, a candy bar, given a linear equation, that candy bar is 40% of what it used to be. That is the price to pay for all of the supposed economic growth that the 1,000% increase in the Dow Jones Industrial Average would suggest. Whenever you review your finances you need to take into consideration price inflation. Whenever you see that your life has “improved” – relative to what – is always the question you need to ask. Buying less of a candy bar with the same dollar bill doesn’t sound like progress. Over the past many years the stock market has returned a 6% (not inflation adjusted) average. The rate of inflation, on average, has been approximately 2.5%. Any kind of approach to your investing and savings needs to keep this in mind. A 3% annual return in equities does not go far with a 2.5% inflation rate. This is the challenge when you set out to invest. The very first barrier you need to achieve is beating the rate of inflation. The second goal would be an approach that beats the market average. Keep in mind there are investing professionals all over the world that work daily to do just that; no tall order. Keeping in mind these parameters this will give you respective when you think of money and its utility. NextIs The United States Dollar Real?